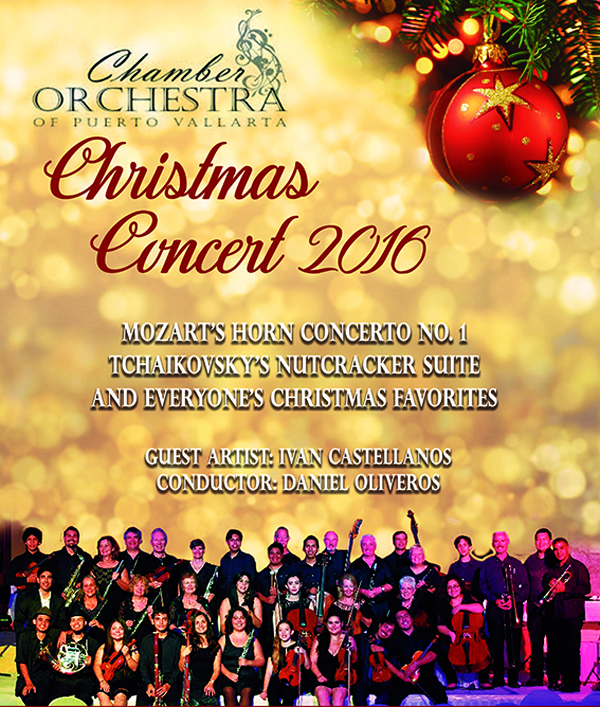 The Puerto Vallarta Chamber Orchestra invites you to their Christmas Concert 2016 with Mozart's Horn Concerto No. 1, Tchaikovsky's Nutcracker Suite and the Christmas favorites everybody loves! Guest Artist is Ivan Castellanos and Daniel Oliveros is Conductor. The Puerta Vallarta Chamber Orchestra will be performing their two annual Christmas Concerts on December 11th and 12th at 8:00 pm. The performance on Sunday, December 11 will be at the American School in Marina Vallarta. The venue for Monday, December 12 will be the Paraiso Salon of Paradise Village in Nuevo Vallarta. Suggested admission donation is 150 pesos for adults and 50 pesos for children. Tickets are available at the door. PVCO is an intercultural cross-generational project that has grown to the size of a full orchestra, with the gorgeous sound of over 45 musiciansas the result of auditions this year adding 10 new members. Now the name "chamber orchestra" is a bit of a misnomer. It also houses and supports different ensembles, like the new Flute Ensemble that will be performing on December 10th at the Sheraton Bugambiliasfor a fundraiser for Angeles de Libertad to raise money for people who cannot afford medical care, and the Salty Paw Jazz Orchestra, a student Big Band that has been performing in several venues around town. The PVCO is also delighted to introduce wonderful changes this season. There will be three programs instead of the usual two. February's concert, "An American in Puerto Vallarta" will highlight music by North American composers, including George Gershwin's Rhapsody in Blue with virtuoso pianist Rachid Bernal as guest soloist. The spring concert in March will feature music from the Balkans, including Antonin Dvorak's Slavonic Dances and New World Symphony. The very popular, ultra-talented gipsy jazz group Moruno will also perform then with the orchestra. Stay tuned for date and venue details. The PVCO is a volunteer organization and relies on community support. Importantly, for several years the American School has generously provided PVCO with rehearsal space, storage space, a performance venue, and an overall appreciation of who and what the orchestra stands for - these are immense contributions that the orchestra members deeply appreciate. As the orchestra grows, so does the need for a dedicated physical home - a space for lessons, rehearsals, performances, meetings, and always the possibility of new student and professional activities - all with the opportunity to give to the community. The orchestra appreciates your donations. They are needed for music stands and chairs for new members, purchase of timpani (kettle drums) and other instruments, music purchase, costs of concert set ups, sound and light equipment, videography, and printing, to name a few, and of course a home base. If you wish to make a donation now, please contact Daniel Oliveros by cellphone (322) 105-8344, on Facebook or at d_oliveros@yahoo.com. Don't miss this wonderful concert which has become a tradition in Vallarta-Nayarit.